EPR Properties (NYSE: EPR) is a unique real estate investment trust (REIT). It owns properties in three industries – entertainment, education , nd recreation. The company leases properties to 158 Megaplex theaters and 11 family entertainment centers that include bowling alleys and go-kart courses. It also leases golf courses, ski areas, and public charter and private schools. Funds from operations (FFO), a measure of cash flow used by REITs, has been steadily climbing for the past several years – although it is expected to slip in 2019. This year, EPR Properties’ FFO is forecast to come in at $436 million, while the REIT is expected to pay shareholders $336 million in dividends for a payout ratio of 77%. The payout ratio is the percentage of earnings or cash flow (I use cash flow) that a company pays in dividends. Next year, due to lower projected FFO, the payout ratio is predicted to be 83%. For a regular corporation, I want to see payout ratios below 75%, but REITs are different. 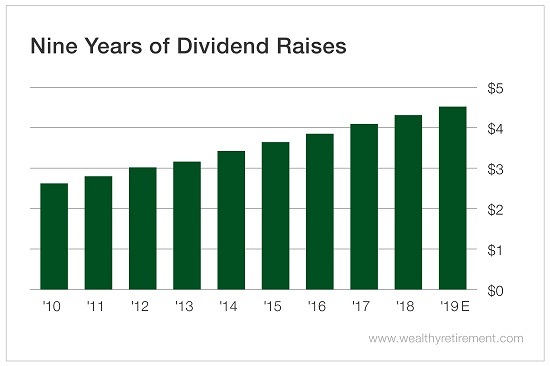 By law, REITs must pay out 90% of their earnings in dividends in order to take advantage of certain tax benefits, so as long as a REIT’s payout ratio is below 100%, I’m okay with it. The company pays a monthly dividend. In fact, EPR Properties just raised it for the ninth year in a row. Management did cut the dividend in 2009, but SafetyNet Pro penalizes a company only if the cut was within the past 10 years. Because the calendar just rolled over to 2019, the 2009 decrease has “aged out” and does not affect the rating. With the newly increased dividend, the stock now yields 6.3%. The current dividend safety rating is already pretty solid, but it could get even better. SafetyNet Pro gives a company a bonus for 10 straight years of dividend hikes, so if EPR Properties can afford a dividend raise again next year, the stock’s dividend safety rating will likely receive an upgrade.